It takes a pretty extraordinary person to survive an encounter with King Shark. Last week’s unexpected run-in with the toothy Suicide Squader on The Flash was just the latest great scene this season to feature the unbelievably endearing Patty Spivot. Joe West’s plucky new partner on the Central City Police Department’s Metahuman Task Force, Patty was first introduced in The Flash’s second episode this season and has been a regular ever since. 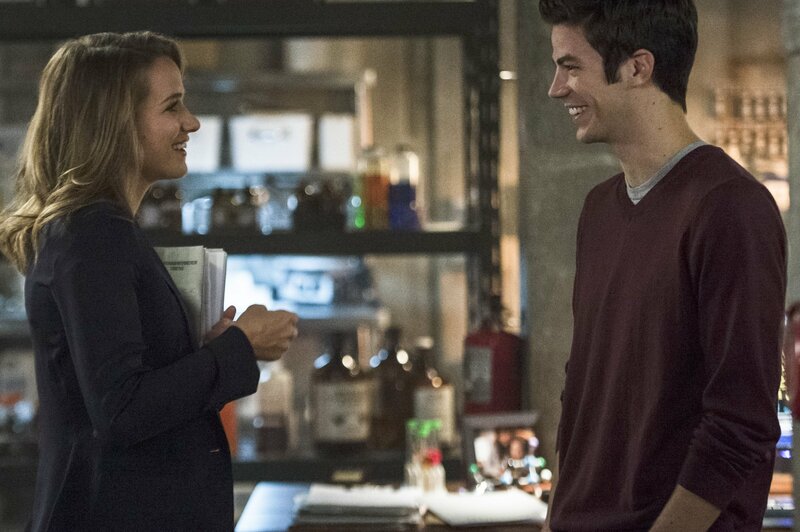 Brought to life by Shantel VanSanten, Detective Spivot’s drive to police Central City’s considerable number of metahumans is matched only by her quickly growing affection for Barry Allen. Considering Patty’s comic book history since the character was introduced in 1977, her flirtation with Barry can’t really be seen as all that surprising, nor is the fact that it seems to be working. Of course, when the actress behind the character is so enthusiastic, intelligent and charming, can you really blame the Flash for falling for the new girl in town? At this time, we’re just getting to know Patty Spivot. What words would you use to describe her? I would say that she’s smart, ambitious, capable, confident, spunky, quirky and nerdy. I think that she’s also really strong. Makes sense to me. From what we’ve seen of her, I’d say she’s all of that. Yeah, were those your words as well? Well, one word that you didn’t mention, but that I thought really applied to her was “determined.” She’s determined when she sets her mind to something, like getting herself onto the taskforce. Is that a quality that you share with her? Yes, for sure. In this industry, you have to be ambitious. There are so many auditions you go on before you ever get a job. You have to be determined and have an ambition that cushions you through even the darkest and lowest moments. I think that’s the same for Patty. I don’t think she likes taking no for an answer. She’s made her life about finding justice for her father. I admire her for that. It isn’t like she comes in with this chip on shoulder, and there’s this really dark, torn apart person. It’s more like, “This has happened, but I’m going to make sure I get justice.” And in the meantime she’s this fun, quirky person that you don’t necessarily expect has this really dark thing in her past that she’s fighting for. She’s part of the CCPD’s Metahuman Task Force, but she has no powers of her own. Are Patty and Joe in over their heads? I would like to say no, but I know some of the metahumans that we’re going to encounter and sometimes, yes, they are in over their heads. But I think they have a drive. Patty says that she doesn’t have powers, but she wants to stop them. It’s like you said, there’s a determination and a will that she has to want to make a change and stop metahumans. No matter where that’s coming from, it will sometimes push a normal human being to do things that they didn’t even think they were capable of. I think that it’s a beautiful message, especially in our day and age. Of course, nobody has super powers, but even normal, real human beings can make a difference. She’s ready and willing to do that. We’ve learned that Patty’s father was killed by Mark Mardon. How much is she motivated by vengeance? I would say it’s about justice. In the speech that she gives Sand Demon, she says that he had a choice, but he chose the wrong thing. He chose to use his powers for a bad thing when he could have been doing something good with them. I think each metahuman that they put into jail is a small victory in her mind. I don’t know if she ever thinks that Mark Mardon will come back. I don’t know if she expects him to because it wouldn’t be as though he’s seeking her out. He didn’t kill her father because he had anything against him. It wasn’t personal. I’m sure that storyline would be interesting if they ever [tell it], but I don’t know when or if it will come into fruition. But I think it would be really interesting to see in that moment whether or not it is about vengeance—if it does come from that place or if her heart struggles with that when she comes face to face with it. Patty and Barry have a pretty unique relationship in the comics. How would you describe it on the show? It’s been so much fun to have those moments and to laugh at each other trying to pronounce things. But that would be Patty and Barry. They would just go for it and not care if anybody gets their joke. There’s plenty that Patty tells that Joe does not understand or get. In that sense, the fact that Barry does get her and genuinely laughs at her jokes and vice versa was such a great moment to establish for their chemistry. Also, Barry in his role as CSI seems determined and invested in taking down criminal metahumans, so it feels like they’re on the same team and connect on so many different levels. Well, the reason I say that is because Teddy Sears said more or less the same thing—how hard it is to say all these pseudo-scientific things that find their way into the dialog. He singled out the frequent line about how “the particle accelerator exploded” as a particularly hard one. So then you also type in “comic book,” and then you’ll get some [pages] with illustrations. But I always like to be able to understand what I’m talking about, so I often do research as I’m reading scripts. That part’s kind of fun and interesting to be able to go back through. I read some of the recent comics about Patty and read a little bit of the older comics to see where the story has gone. I keep wondering what Andrew [Kreisberg] and Greg [Berlanti] are going to pull from that. They’ve pulled a few things here and there, but they don’t ever really stick to a certain comic. I love, by the way, that you got the back of my head in the “Two Worlds” image. Even if it’s the back of my head, it was recreating a cover of a classic comic. That is so cool to me! It’s one of the most famous Flash covers in history! Do you think you, Grant and Teddy are going to be selling signed prints of it at Comic-Con? That would be amazing. I would love that! So, I think by now we know the answer to this, but just to get it on the record, will there be romance between Barry and Patty? Oh yes, I think that’s what this season is about—developing their relationship. We’re both keeping secrets from each other, so also we’ll see where exactly that will lead them when those are exposed. We get to see their first date and all of the wonderful relationship stuff that comes along with dating. It’s my understanding that Patty’s going to be around for a little bit, so I’m guessing that they’re going to develop quite a relationship. Grant and I have so much fun working together. It’s coming up with ideas and reading the scenes and feeling like we’ve gotten a grasp on what Barry and Patty would do in certain situations. That part’s awesome when you have really great scene partners and actors to work with. The Flash airs Tuesdays at 8 p.m. (7 p.m. CST) on The CW. To get to know another of Season 2’s new cast members, be sure to read our interview with actor Teddy Sears (Jay Garrick).